Some people are reporting hundreds of lost followers. Trans Twitter has witnessed a spike in transgender users having their accounts suspended or banned on Twitter, and people are searching for answers. Given the apparently related manner in which these suspensions are happening, the community suspects a targeted effort against them. But who? Everyone lost a few followers in the sweep of Twitter bots a few months ago, but most were unbothered by the drop, knowing it was just bots and not people. However, over the past couple weeks, some trans folks and their allies are seeing even bigger drops in numbers, leaving the community reeling. Trans people who have had their accounts temporarily locked are returning to the platform to share screencaps of the content that caused Twitter to take action against their accounts. Some of the tweets are recent, some are years old, suggesting that it is not people just reporting tweets they see, but actively searching through trans folks’ tweets for any content they can report. Some people suspect there has been an internal policy change on Twitter’s part that has now designated TERF as a slur. As TERFs have successfully convinced other platforms, like Teespring, that this is the case, it is not a stretch to think Twitter has made this designation as well. 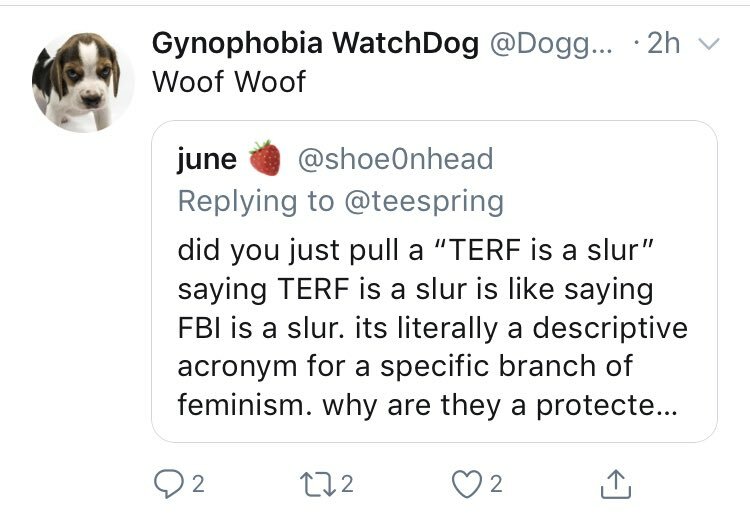 However, as TERF is an acronym to represent anti-trans feminists, trans people say designating it as a slur effectively silences trans people from talking about those who oppress and abuse them. Twitter pointed the Daily Dot to its hateful conduct policy and clarified that it does have a team that reviews the context of tweets and behavior of the users, but didn’t clarify whether it’s addressed the designation of “TERF” internally. One of the most powerful tools trans people have is in naming our oppression. Cis people taking that away from us, saying that nothing is transphobic, pretending that cis and TERF are slurs are all violent acts of transphobia that normalises anti-trans abuse and hatred. Based on the breadth of reports, it appears that there's a certain word which Twitter's policy team has designated as a slur. The word is an acronym factually describing people who hold a certain category of transmisic belief and attempt to enforce it on others. However, others doubt that it’s a policy change, and believe it’s an organized effort by TERFs to push trans communities out of the public. One trans Twitter user, who wished to remain anonymous, shared her evidence with the Daily Dot for TERF itself not being the sole key to this censorship. “Anecdotally I’ve been using TERF constantly without consequence, and so have many others,” she said. She pointed to the Twitter account Your Fave Hates TERFs as further evidence that just using the acronym is not enough to have action taken against you. Yet the combination of TERF and any keyword that could be considered violent seems to be all it takes to get Twitter’s algorithms to designate a tweet as abusive. Rather than an explicit policy change, it seems to be TERFs abusing an automated system that sees words like “kick” and “punch,” but not the words that give them context, and certainly not the societal context that informs how trans people talk about TERFs. This account has been suspended, but it set a precedent. Discussions of the harm TERFs do to the trans community, or even light-hearted jokes at their expense, might be enough to get someone removed from the platform altogether. While some hope that Twitter will rework its policies to protect against the abuse of its reporting system, given Twitter’s historically lax policies toward in-platform hate speech, the community isn’t expecting much in the way of recourse. Update 11:32am CT, Aug. 27: The Daily Dot has received information about where at least some of the mass reporting is being organized. @Hormordr on Twitter is reportedly putting out calls to action to report trans-positive accounts, and working hard to cover their tracks. The account goes between being public and protected and frequently deletes tweets calling for people to be reported after action has already been taken. What is most sinister about @Hormordr is that they are successfully organizing people against completely innocuous tweets. By explicitly telling people what to report these non-abusive, non-harassment tweets for, @Hormordr appears to be successfully using the fact that Twitter automatically responds to mass reporting without checking the content of the reported tweet. The only recourse for trans people targeted by these malicious false reports is to contest them, and hope for the best. However, they may find themselves back at square one quickly, as the organization appears to continually target people when they return to the platform.